We are one of the most leader experienced Phuket Golf Booking travel agents in Phuketoperate by the name of "Golf At Phuket" Website. Our main services are Phuket golf reservation from 4 Phuket golfcourse and one Phang -Nga Golfcourse. Club spreads over a lush, rolling 400 rai (160 acres) hilly plateau. This 18-hole, par 72 course has been masterfully designed to blend beautifully with the natural terrain. PHUKET COUNTRY CLUB established in 1989, is the first and one of the finest golf courses built in Phuket, over a reclaimed tin mine site. is a challenging 3575 yards (championship tee) par 37, 9-hole course, particularly suitable for the low handicap golfer. 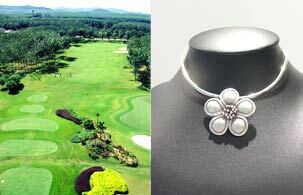 Laguna Phuket Golf club is a resort style 18 hole golf course located within the Laguna Phuket development. Situated on the exclusive Bang Tao Bay on the western shore of Phuket Island , this par 71 layout stretches 6,850 yards from the championship tees. Great chance to view this exclusive-championship course of Asia through our authorized package. A must for those who need something above standard accommodations at the club's luxurious hotel room also available. Newest of all the only real Andaman Sea-side Course located in Thai muang District in Phang-Nga (greater Phuket) about 40 km. from the airport., the course is said to be one of the best of the world. We personally buy the different gems necessary for their stunning designs. All rings are cast to size, and craftsmen cut and inlay each stone for a perfect fit. Every piece of jewellery created is hand polished not tumble polished. The difference is noticeably visible, and shows the care and pride taken for each individual piece.